How to get to Jurmala from Riga Airport you can find out here. How to reach Jurmala from Riga city center by public transport you will get know on this page. How to call taxi and all about taxi in Jurmala you can read here. Jurmala - long and narrow city which is stretched along the sea and all routes of Jurmala buses go on one street which is parallel to the sea beach. There are 7 city bus lines and 4 minibus lines In Jurmala. In addition there are a few lines of minibuses from Riga as well as more than 30 transit buses (interbuses) per day make bus-stops in Jurmala. Look at the map of Jurmala, on the 2nd page of this booklet. Increase the scale (zoom in) this page and you will see lines of Jurmala public transport on this map. Red lines - minibuses routes, green lines - Jurmala bus routes. Routes of Jurmala buses: No.1 Lielupe-Bulduri, No.4 Bulduri-Kauguri, No.6 Sloka-Kemeri, No.7 Priedaini-Dubulti, No.8 Bulduri-Valteri-Sloka, No.10 Bulduri-Kemeri (express), No.10a Bulduri-Kauguri-Sloka (express), No.14 Kauguri-Kemeri. The timetable of Jurmala bus lines and minibuses you will find here. Price for ticket in Jurmala bus: 0,50 lvl (children up to 7 years - free of charge). You have to pay the fare for ticket to bus-driver when boarding. In addition to these bus routes in Jurmala every 5 min. go minibus from Riga: No. 7023 Riga-Jurmala-Kauguri-Sloka, No. 7021 Riga-Dubulti, No. 7020 Riga-Jaunkemeri. The schedule of these minibuses you will find on this page. Riga's minibuses go to Jurmala and back from 6 am till 12 or 1 am o'clock in the night. More info about minibuses from Riga here. Long-distance transit buses (intercity buses) do stop in Jurmala, only in Dubulti and Lielupe bus-stops. The schedule of these buses you will find at this site. Point of departure or arrival must be bus stops Lielupe or Dubulti (Jurmala). To find out what transport you need to reach a specific address in Riga - use the interactive map on this site. Enter the necessary address and in the line above the map select the type and number of Riga transport and you will see a stop directly on the map. And the timetable of traffic of Riga transportation look here. 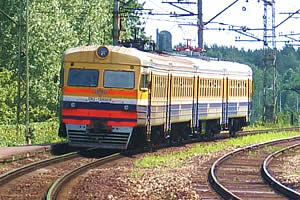 Suburban electric train - this train run along Jurmala and go to Central Station in Riga and back. Trains in Jurmala are spacious, fast and inexpensive type of transport. Railway road is located near the sea beach in Jurmala and that's why if you take long walk along the sea beach - you can always go back on the train. There are 14 railway stations in In Jurmala (look the map of railway stations here) and when you're buying the ticket you need to say the exact name of station and not just only "Jurmala". Trains run every 30 minutes (the first at 5:50, the last at 23:40), and on Jurmala's train you can get to the Central railway station in Riga, where you can connect either to the international trains or to the another electric or diesel train to the other direction of Latvia. Time to get to Riga from Jurmala by train 30 minutes, the price of the ticket from Majori station to Riga - 0.95 lvl. You may buy train-tickets in stations or at controller-guard in every coach wagon of train. He sell train tickets more expensive. See the schedule of trains in Latvia here or here and the cost (price) of train tickets on site of Latvian Railway. How to reach Jurmala from Riga Central Station by train you will get know on this page.